I have written about lots of machinery at our workplace: the table saws, the jointer, the router, the disc sanders and the belt sander. 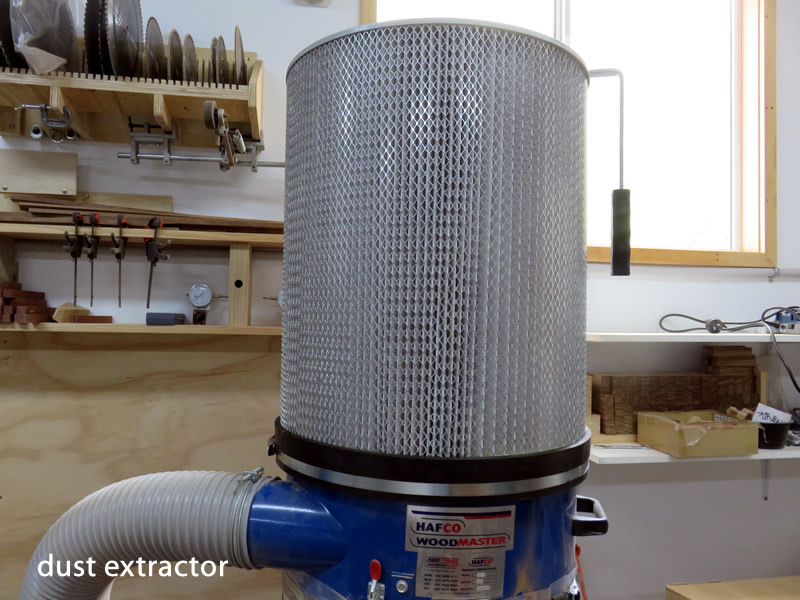 The next subject is the CNC router and the dust extractors. 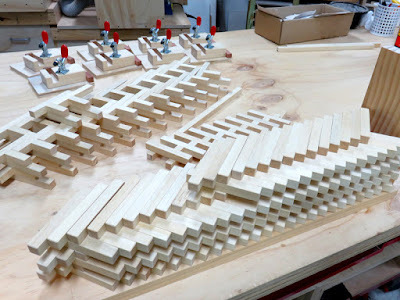 I have mentioned the topic of the CNC router before, just a little but this time I will show you the details that Juno has done. First of all, he considered what type of CNC router is the best for our work. Gantry type CNC routers seem to be common in the market. The CNC router we bought is a column type, and one of the major differences between the gantry type and the column type is the travel range of the Z-axis, up and down. The column type routers have a wider travel height of the Z-axis, that means you can process thicker or taller objects on the work table. 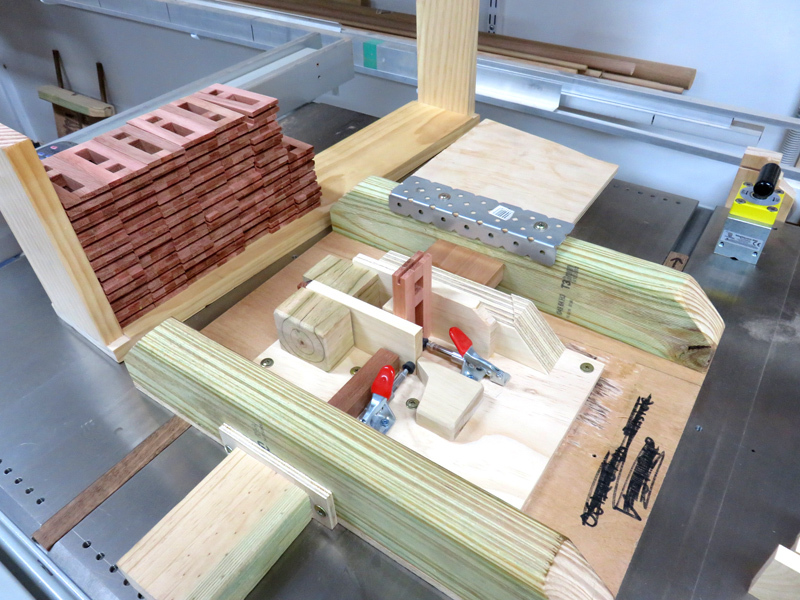 It also gives room for sacrifice boards, various jigs and clamping vices. 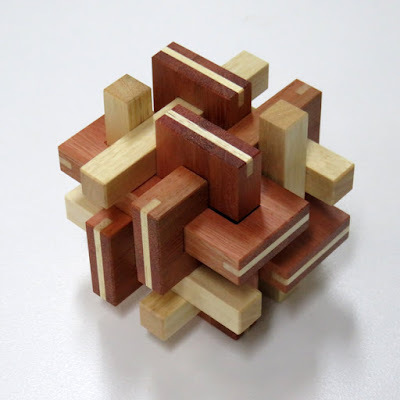 As you know, we produce three dimensional wooden puzzles and those puzzles or puzzle pieces sometimes have significant length to X, Y and Z-axis. 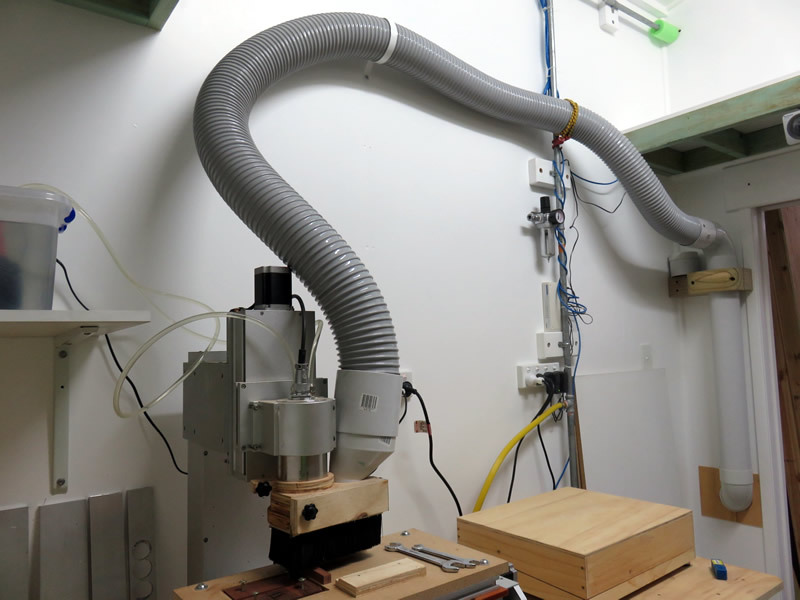 Juno is now using the CNC router to make new secret box puzzles. I'll write about his new puzzle later someday, I can just say his secret box puzzle is a very unique design. Oops, let's get back on track. Commonly, a CNC router is connected to a desktop computer with a parallel cable. However, he wanted to use a laptop computer with a USB cable. One of the reasons is new OSs doesn't support a parallel port. Old computers which have parallel ports sometimes don't have enough performance to run 3D CAD and CAM software. In addition, the other devices like a monitor, keyboard and mouse have to be around the computer and a desktop computer itself needs a larger space than a laptop computer. He didn't want a messy workbench, you know? A Laptop computer doesn't require a larger workplace as its battery works as a UPS, so when it's needed to search something the laptop computer can easily be connected to the internet because it usually comes with a wireless adapter. 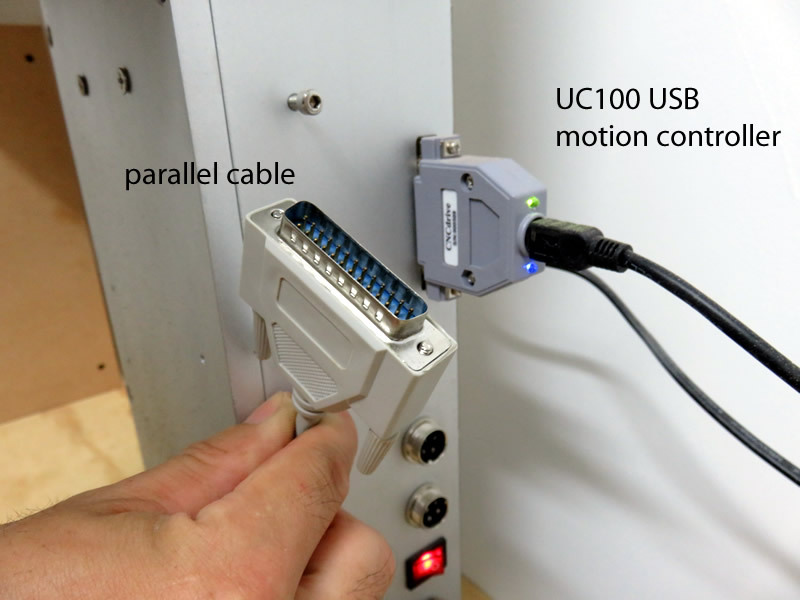 The key device to connect the laptop computer and the CNC router is a UC100 USB motion controller. 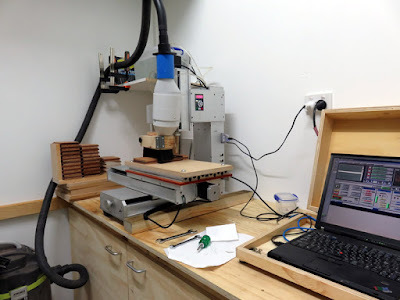 He uses 32 bit Windows XP for controlling the CNC router now but he made sure that 64 bit Windows 7 can also be used without problems, thanks to the device. CNC routers are very convenient machines, but still have awkward things that have to be solved like other woodworking machines, that's sawdust. Here is the dust boot Juno made of plywood. 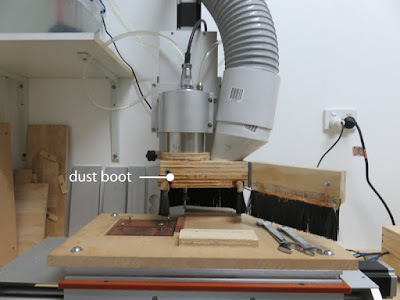 To collect the sawdust efficiently, he elaborated the shape of this dust boot using the CNC router. The brush underneath the spindle motor was bought at AliExpress. Depending on the type and length of milling bits, the height of the dust boot can be adjusted by undoing the star knob. The dust boot helps to collect the dust well, on the other hand there is a problem changing the milling bit. 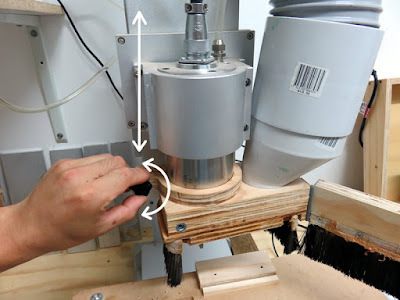 Someone used magnets and made the bottom half of the dust boot able to be detached easily, or someone set the dust boot to not move with the milling head to give accessibility to the milling bits. Those experiments can be seen on a thread at the cnczone.com. Juno made a door with a star knob in front of the dust boot as shown in the picture below. 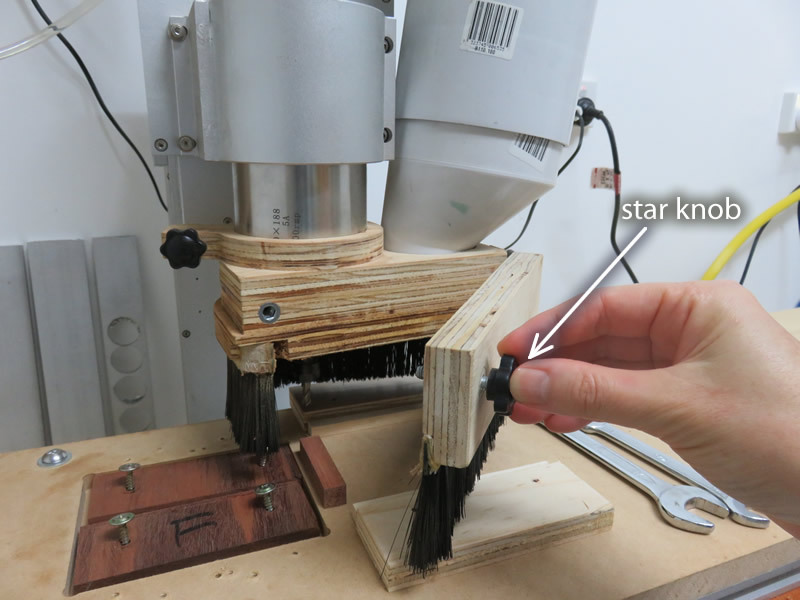 He says that if he has a chance to make a dust boot again, he will use magnets instead of a star knob to keep the door shut. - The suction power is weaker than an industrial model extractor. - The room where the CNC router is set gets hot in a short time. - The vacuum cleaner is not designed to be used continuously, for several hours. 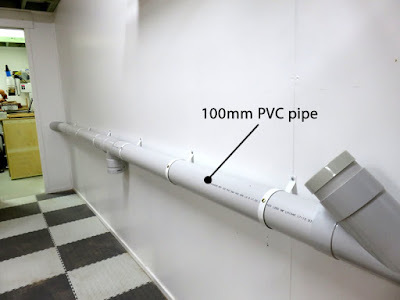 Recently, he did some plumbing work to connect the CNC router and the big dust extractor. He mainly used 100mm PVC pipes and partially used flexible hose. 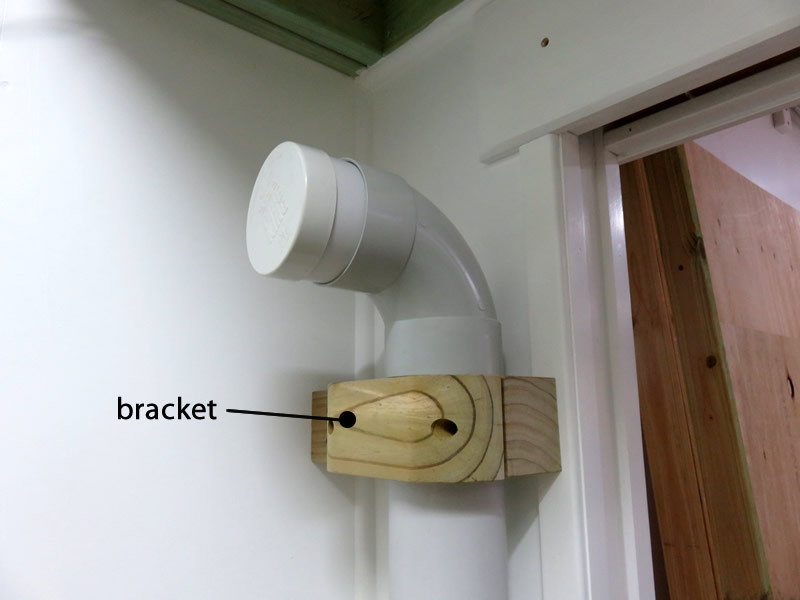 When the CNC router is not in use, he puts a cap on the L connector. When it is in use, the flexible hose is inserted into the L connector. The CNC router and the dust extractor are about 10m (32.8 feet) apart. 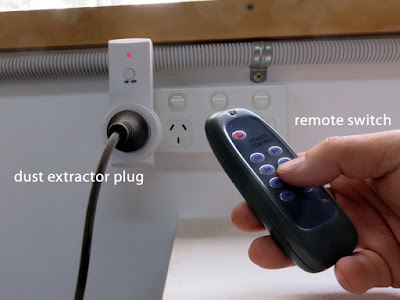 It's not convenient to go to the dust extractor just for turning it on/off every time he uses the CNC router, so he bought a cheap remote switch. Since he started using the remote switch for the dust extractor, the work environment has been improved dramatically. The cost-effectiveness of this remote switch is high, it's highly recommended. The New Puzzle "Pseudo Ovolo"
Today's topic is about Juno's latest puzzle "Pseudo Ovolo" that he had started making on 30th January, 2017. 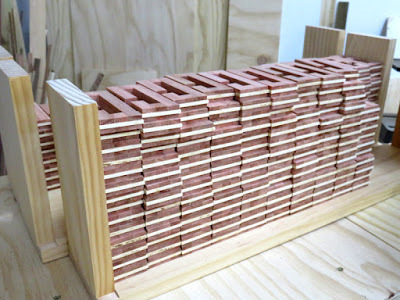 He bought timber that has been kiln dried from the local lumber dealer who he is familiar with. First of all, he made the timber a little thicker than the target measurement and rested it in the shed for a while. And then he re-worked the timber to the target measurement. 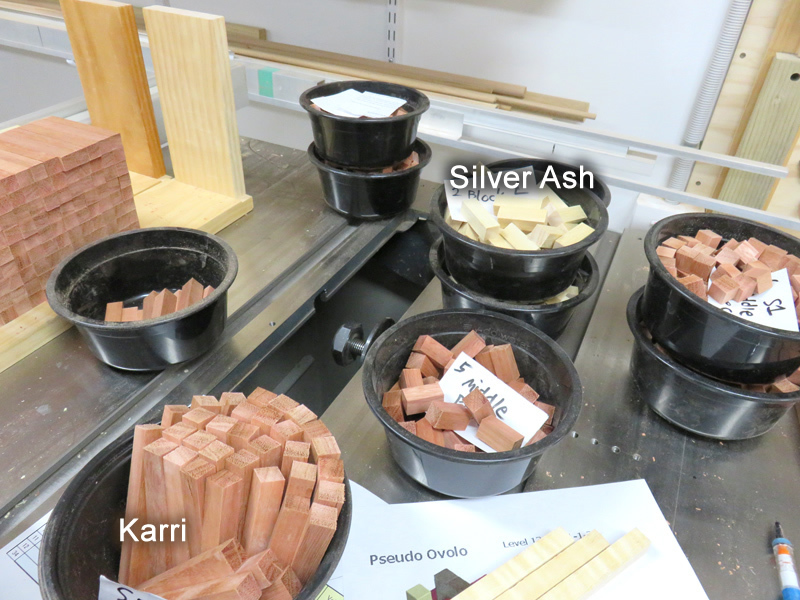 Pseudo Ovolo is made with Karri (red-brown timber in the picture) and Silver Ash (white timber / citrus family tree). This was the very first time using Karri for him, and he realised that Karri is difficult to handle and if he used up all the stock of Karri, this time may be the last time for using Karri. After he processed the timber into sticks, he cut the elements from the sticks. At this stage, he has arrised some of the elements. For gluing each piece, he made a jig to support two elements of timber to be glued at right-angles. As you can imagine, there are so many jigs remaining in our workshop because he makes jigs every time he makes new puzzles. 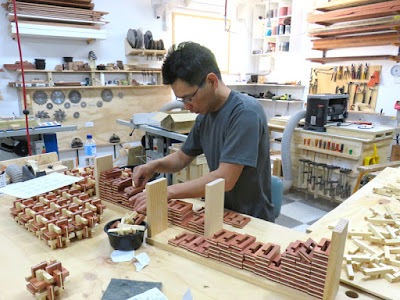 As shown in the picture below, after he finished gluing the pieces made from Karri (red-brown), he cut the groove for reinforcement on each end of the piece. He prepared a replaceable sacrifice board (white board in the picture) in front of the piece to eliminate chip outs. He had cut the white timber (Silver Ash, citrus family tree) a bit larger, and after gluing to the red-brown pieces, sanded them until it became the correct size. 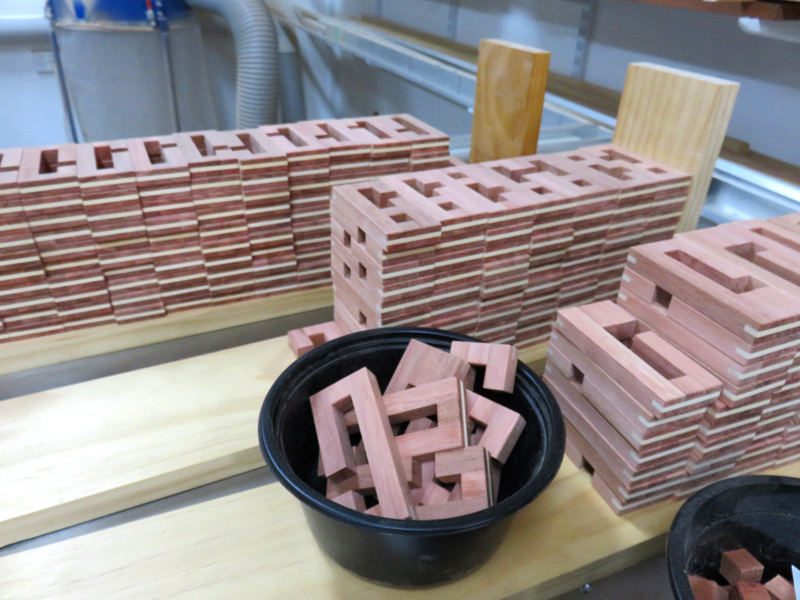 Every red-brown piece was glued into an O-shape and then, it was cut to a C-shape. Herewith, the grains of the two ends of the C-shaped piece look linked and also the piece can be made accurately. The next step is arrising the edges of every piece. 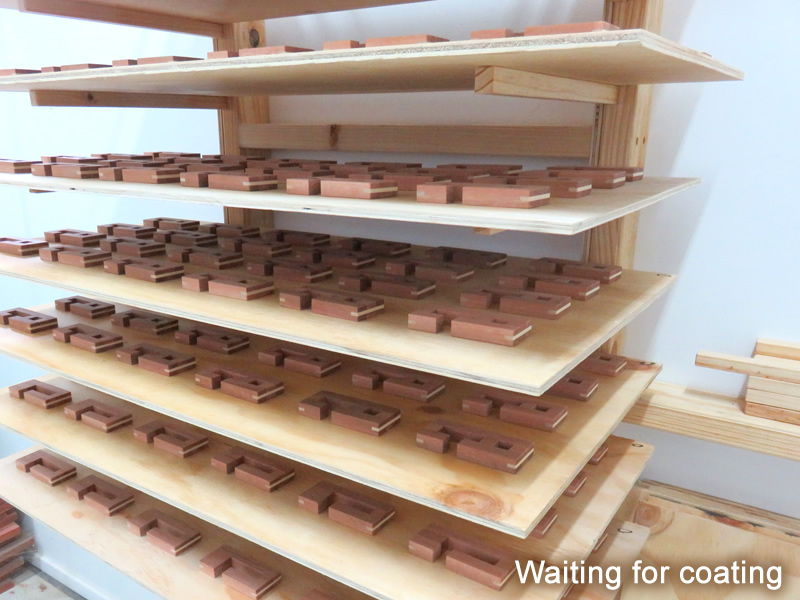 Then, it was finally time for coating. A thin coat of lacquer spray makes timber more beautiful and protects timber from dirt. After every piece was dried, he sorted the pieces by colours and grains, and then assembled pieces into a puzzle in which the timber colours and grains are matched. Ta-da! Here is the puzzle "Pseudo Ovolo." 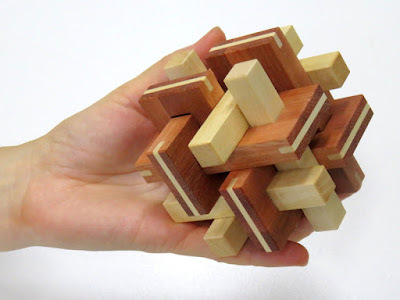 Juno named this puzzle "Pseudo Ovolo" because he was inspired when he saw Yavuz Demirhan's "Ovolo" and wanted to show his respect to Yavuz Demirhan. Pseudo Ovolo is available on our website. Juno and I hope that puzzle lovers would love Pseudo Ovolo.